Product is great and in very good condition. I love the prompt response from the customer service when the product didn't reach on time. Lost in transit...nevertheless it was resolve as fast as they can. Thanks...it was my pleasure dealing with you guys. Till next time??? ?hope no more delays. great service thanks, product exactly as described. Delivery very prompt. Great customer service. Always keeping me up to date on package delivery. The pics, description and reviews sold this beautiful case to me. Well done Mobile Fun. Surprised by how much I likel it. Not sure how long it will last. It seems durable enough but I am a bit worried about sctratching it. However, no problems so far after about 2 weeks. I would like to know how it works. I alwayd read all the reviews and compare to other cover case before ordering items. Some of the review makes you think twice. But when I received the items, I'm happy and surprised of the product qualities, it's really good and my phone looks smart and descent. Yes the price is high than other websites but this one is worth it . No regrets , highly recommended! Great looking case, should have brought it when I got the phone. This product was an excellent buy. All of the goods purchased from Mobile Fun are excellent value for money and you have peace of mind that you are getting genuine product instead of copies. I would certainly recommend your company to other friends. Service was prompted and was delivered before I was expecting it. Unlike the previous, unofficial, cover I bought through a well known on-line retailer, this one actually works. The screen is visible through the cover to check the time or answer a call and you won't get any phantom opening of apps. Well worth the extra money to get an official Samsung cover. Bought this for my daughter - she loves it. It is very pink - but not as metallic an effect as the gold clear case - so if you are looking for a more metallic look then this one might not be for you. Just what I was looking for to protect my phone, stylish and sturdy. Looks lovely, love the clear view front to answer calls and view notifications. Love the colour too, and definitely worth the money. Love it! Stylish and really cool. Couldn't find that coloured in my city. Thanks to Mobile Fun! All as described. Love it. Great cover at a good price for a quality Samsung product. Delivered in two days by Royal Mail. Very pleased with all aspects of purchase. Great cover for Samsung Galaxy S8. Stays closed in handbag so protects phone & looks stylish. I have had admiring comments about my phone cover. Absolutely love it. Nothing better than I expected. Turned up in good time, very pleased with my purchase. I was a little concerned over the delay in delivery and contacted Mobile Fun. They resent the order but I ended up with two cases, they having arrived a couple of days apart. A realistic time frame might help. Having bought a cheap version of this case, I was very dubious to buy an expensive one. But this case is way better! Stays shut, which the cheap one didn't, automatically puts phone into sleep mode when closed, and can be used with wireless charger too. Very pleased with it. The front does get marked easily with finger prints but really this isn't a problem. I like that you can see the time and date and notifications and whose calling without opening the cover. I am really pleased with the cover, it wasn't cheap but so far I feel happy with my purchase. Very pleased with every aspect of my purchase. Cheapest genuine Samsung Galaxy S8 case on line. Previously I had a genuine Samsung S-View cover for my Galaxy A5 and I was so pleased with it that I wanted a similar case for my new S8. Sadly Samsung dont do an S-View cover for the S8 so I had to find something else. I compared this with the LED view cover that they do and I chose this one. It does what I need it to do and Im very happy with my choice. Some reviewers of this product have complained about the fingerprint marking on the front cover but to be honest it didnt really bother me and one wipe with a soft cloth from time to time sorts it out. No different to wiping the phones screen itself from time to time. In short, an outstanding cover that allows tyou to see whos calling and answer or reject, the time can be set to always on, see message notifications, you can see and operate your music player when its active etc All in all, a very functional cover that does exactly what I wanted from it so Im very happy and can reccommend it. Good folding case. Works like its supposed to. Was it good quality, easy to use and look good? Yes! It ticks ALL tics box's for a premium piece of kit for a very expensive phone. This is a quality case and I bought it as the one I had for my s6 did a great job of protecting it. The only negative thing is the price which is unfortunate but its worth protecting a decent phone. Bought this cover for my upgraded phone (s8), fits perfectly, allows u to use your phone to answer calls with the cover closed. I really like the part that allows you to stand your phone for watching movies & programmes. Had a similar cover for my last phone, it kept my phone scratch free & I had it for 2 years. Have always had a case for my phone and the beauty of this one has reinforced my view that it is a must have accessory. However, quite pricey. 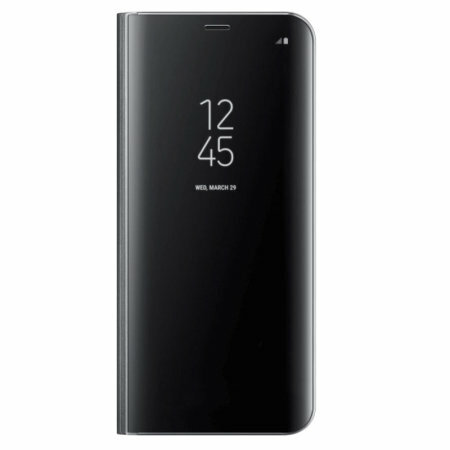 There is not a lot of choice for cases for the Samsung Galaxy S8 and most of them are quite plain and boring. Chose this as it said it was 'violet' It is really not. It is a dull purpley grey.The case itself is quite clever, but for the money wish I hadn't bothered. This phone case is convenient and protects my new phone very well. Also it looks nice and it doesn't seem to scratch easily at all, which was a concern of mine. It folds open well but I can also open it up for easy viewing by tucking the shiny gold faceplate under my phone. So I can get two different viewing angles. When closing the faceplate, it turns off the phone viewing screen and the side buttons are located well also. Best phone case I've ever had! To be honest I normally wouldn't buy a case of this price as I have never been that excited about them. Basically if it did the job I was happy. But I have to say that I'm glad that I bought this one. It's classy looking and protects the screen from scratches. It folds into a stand which is helpful if watching a video etc. I'm very happy with mine! Best case they have made yet. Maybe a bit pricey but worth it. Buy one well worth it. Best cover I have had for a Samsung phone. Does what it says on the tin. Love the colour (blue) - matches my phone perfectly. Really happy with the case and great customer service when I needed to get in contact. This Samsung Galaxy S8 Clear View Stand Case is fantastic. The phone is exactly what I wanted and what I have been looking for. It's a best buy for me and serving it's purpose. I really enjoy using it all the times. Good lucking and tough. Just like me. I had ordered initially an S8 plus cover. Sent it back and already got reimbursed. This THE cover I wanted. It was a gift. And caused delight. Very stylish and also it's variability for viewing/stand makes it cool. I can just recommend This!! The front flap doesn't ever stay shut. This case is horrible! The front flap doesn't stay shut. My phone fell while in this case onto the pavement and I now have a smashed screen. Not worth how much money it costs!!!! The case looks great. It has a textured looking back and a hard shell front. It's really more for aesthetics rather than protection but it can help against scratches and minor drops. The case as itself has a speaker hole in the top where you can also put things like a phone charm. The front of the case can almost double as a mirror and you can stay on calls with the cover closed. The inner portion of the front is nice a soft material which should get rid of the scratching issues from the past ones. The hard shell is scratch prone and the back of the case is made of a material that seems to be difficult to clean effectively. The convertible stand portion works as intended but it can sometimes take a few tries to get it to stand. If you want a slender case that looks great this is one you should get but you still need to be mindful of what you do with it because while it does protect your phone the case itself could be damaged instead. Love the case .... !! Love my new purple S8 cover love I can see the time through the cover while my phone is protected and the purple is amazing. Love the case just disappointed that it couldn't work with the glass screen protect that I also ordered. Was no reviews when I purchased this case,as I pre ordered this and the phone. The case is very good looking,having its own new unique style. The stand is handy for viewing videos,sports etc. Protects new phone well without spoiling looks.Quality product from samsung. Display looks great. Happy customer. It's brilliance ought to draw the crowds!